There are plenty of reasons why you don't want to be around mercury under any circumstances. It's toxic, and can lead to emotional and mental instability. On planes, it can lead to structural instability. As in, ripping them apart. But how? How does a plane, which is made to withstand being accelerated up to seven hundred miles an hour by burning jet fuel, get ripped to pieces by a broken thermometer? Chemistry, that's how. Chemistry is the modern equivalent to witchcraft. "Oh, add the XXXX-ate to the YYYY-ide, and they'll suddenly consume each other and produce a vapor that kills everyone in the room." That's the kind of statement that's made by a hag stirring a cauldron full of wool of bat. The only reason we don't start a modern day witch hunt is because everyone knows it's too dangerous to expose a chemistry professor to an open flame. Of course it doesn't help that airplanes are the equivalent of flying soda cans, in that they are cylindrical and made of aluminum. Flimsy as it sounds, aluminum is a good choice in most situations. It's light, strong, and it has an outer 'shell' so hard that it's the next best thing to coating the plane in diamonds. Iron, so strong in buildings, rusts when, say, flying over the sea every day. And when it rusts when it combines with oxygen. It turns into light, red flakes that can be rubbed off. Aluminum, when it combines with oxygen, forms aluminum oxide, an incredibly hard substance that is scratch resistant. (The arbitrary and extreme difference between iron and aluminum's reaction to oxygen is yet further proof for chemistry-as-witchcraft.) Since it doesn't flake off, the way iron rust does, it seals the rest of the aluminum off, preventing further rust and making the entire structure perfect for air travel. Mercury disrupts this perfection. Or, at least, it does the moment that it hits a part of the aluminum that has been recently scratched. The moment it does hit this, it combines with the aluminum, tearing it away from the larger structure. Of course, when the aluminum and mercury amalgam hits air again, the aluminum recombines with the oxygen to form that same, super-hard aluminum oxide. It just forms it in the wrong place, growing 'feathers' or 'pillars' of oxide up from the pool of mercury. 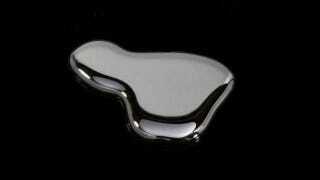 This movement of the oxide away from the original scratch lets the mercury keep tearing through the aluminum until the mercury itself evaporates into the air, and so a small amount of mercury can cause a huge amount of damage. There are rumors that governments during the World Wars used to try to sabotage each other's planes by smearing mercury on them. More credible are the stories of someone breaking a thermometer near some aluminum, say on a park bench, and seeing the next day that there were massive holes eaten through the structure. So today's lesson, kids, is don't bring mercury on planes. Ever. Unless you are a supervillain, in which case we'll let Batman deal with you. Via Pop Sci and Dr B Ornitz.